Includes Joseph Diaz vs. Horacio Garcia & Oleksandr Usyk vs. Thabiso Mchunu. Includes 24/7 Hopkins - Kovalev. Also: Luis Carlos Abregu vs. Sadam Ali. Includes Shawn Porter vs. Paulie Malignaggi & Peter Quillin vs. Lukas Konecny. Includes Keith Thurman vs. Jan Zaveck. Includes Peter Quillin vs. Gabriel Rosado & Deontay Wilder vs. Nicolai Firtha. Includes Seth Mitchell vs. Chazz Witherspoon. 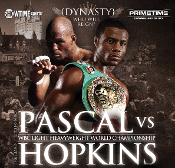 Includes Chad Dawson vs. Adrian Diaconu.